According to Hussain Yaacob (1992), Nik Abdul Aziz B. Nik Mat was born in 1931 at Pulau Melaka, a village located about 7 km from Kota Bharu town. His father, the late Tok Guru Haji Nik Mat B. Raja Banjar is a famous Islamic Scholar at that time. The late Haji Nik Mat Alim was the founder for Pulau Melaka Islamic School or Sekolah pondok (hut type school). Haji Nik Mat really serious about his sons Islamic education and this is one of the factor that contributed to the style of leadership perform by Tok Guru Nik Aziz. He trained all his son and daughter about the Islamic knowledge from early days. Furthermore, Tok guru Nik Aziz also had been sent to learn Islamic knowledge from To Khurasan, one of the most famous ‘Guru’ in Kelantan at that time. Later, Tok Guru Nik Aziz continue his study with a few other Islamic Scholar in Kelantan and Jertih, Terengganu with the late Tuan Guru Haji Abbas Haji Ahmad at Madrasah Ittifaqiah. After 5 years studied at the school, in 1952 Tok Guru Nik Aziz went to India to further his study at the Deoband Darul Ulum in India. The course at Deoband took about 5 years. From India, Tok Guru Nik Aziz continue his Islamic Education at Al-Azhar University in Cairo, Egypt. There, he took the Arabic Language and Islamic Law as main subject After 4 years, this brilliant Tok Guru managed to pass and finish his Bachelor Of Arts and <bold>Master of Art</bold> in Islamic law. 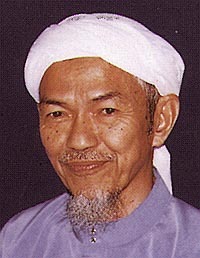 In 1962, Tok Guru Nik Aziz went to Malaya (now Malaysia). Tok Guru Nik Aziz can speak a few foreign languages such as Arabic, Tamil, Urdu and English. In 1963, Tok Guru Nik Aziz married with Tuan Sabariah Tuan Ishak (at that time his wife was 14 years old). Now, both of them got 10 children (5 daughter and 5 sons). According to Tok Guru Nik Aziz, all his children took Islamic education as their main subject. After coming back from Egypt, Tok Guru start his work as the full time religious teacher and become an Islamic preacher, to full fill his father ambition. In the middle of 1960, Tok Guru Nik Aziz was a part time teacher and teaches the adult class people for one year (Guru kelas dewasa KEMAS). He agreed to be the teacher because they (the class supervisor) allow him to gave his lectures without any term and condition (<italic>Tak payah ikut telunjuk atau arahan orang kemas, so dia setuju, jangan silap faham pula macam MB Kedah tu selalu do kata</italic>) . Tok Guru Nik Abdul Aziz seriously join the Parti Islam Semalaysia or PAS after resigned as the adult class teacher. In a few month after that, i.e. in 1967, he was offered as the candidate for by-election for Kelantan Hilir (now Pengkalan Chepa) parliamentary seat. He has won the by-election at Kelantan Hilir or Pengkalan Chepa parliamentary seat from the year 1967 and every time there was another election, he won the seat until 1986 when he was transferred to another parliamentary seat in Bachok, Kelantan. Tok Guru Nik Aziz has been elected as the Central Ulamak Council Chief from 1968 until now. This position give him authority to advice all matters pertaining to Islamic faced by the party and the followers. As a good leader, Tok Guru Nik Aziz’s followers has request to the top party’s leaders to appoint him as the Kelantan state party commisioner. They (the followers) need a leaders that was well versed about Islam and they did not want any secular leaders anymore. At last, the top party’s leaders had agreed to appoint him as the Kelantan’s PAS commissioner, a strong position that give him certain power to manage and control the party’s activities particularly in Kelantan . Compare to the other state, Kelantan is the only state in Malaysia with the biggest PAS followers. In another words, the position as Kelantan’s PAS Commissioner is actually a big opportunity and not so many opposition party leader in Malaysia can hold that position. At first, Tok Guru Nik Aziz did not want to accept that post. He felt that other PAS leader should hold that post, not him. As a humble leader, Tok Guru Nik Aziz keep on telling his follower that he was not the right person. But after so many pressures given to him, at last he accept it based on a <italic>hadeeth</italic> (Nabi Muhammad words) that give guidelines on how a selected leader should not reject a good position if he (the potential leader) has the ability to lead compare to others. Tok Guru As Chief Minister of Kelantan Darulnaim. Tok Guru Nik Aziz has been appointed as the 5th. Chief Minister of Kelantan Darulnaim on 22nd. October 1990 at 8.00 pm to replace former Menteri Besar from the ruling government i.e. Barisan Nasional. He got the biggest majority during the national election for Kelantan. As an emerging Islamic and transformational leader, Tok Guru Nik Aziz has cut off 40% of his salary to be given to the savings of Kelantan PAS (<italic>dia dah buat penjimatan sejak lama dulu dah</italic>..). He also did not accept any allowance provided for him during Hari Raya (the celebrating holiday in Islam). Tok Guru also warned all the elected exco and state assembly members to reject any prize given to them by any people. He felt that the prize given can be considered as misconduct or bribery that could led to corruption.